United National Party (UNP) MP Arjuna Ranatunga yesterday sought to defend his security officer who discharged a firearm, killing one person and injuring two at the Ceylon Petroleum Corporation (CPC) on 28 October, insisting that it was done in self-defence. Ranatunga insisted that the security officer was acting in self-defence when the MP and a group with him were attacked by a group of CPC employees. 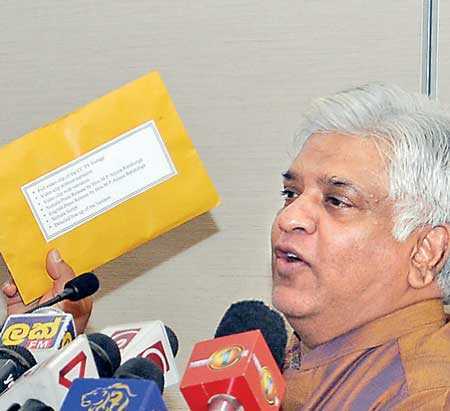 who forcibly entered the CPC premises.” Ranatunga said he had gone to the CPC premises on 28 October to collect keys to his official residence at the Ministry of Petroleum Resources Development as he wanted to remove his personal effects from his former official residence. He also said that he had called the Secretary of the Ministry to be present while he collected his key. He alleged that during his presence the mob attack was led by Kulatissa Deeganage, a member of the Colombo Municipal Council. According to the former minister, when Deeganage had tried to abuse him at the CPC premises the security officer removed him from the lobby area and kept him in a nearby Communication and Marketing Services room. He noted that Deeganage and Kumara were accompanied by a large number of people carrying poles, metal bars and cricket bats. The mob had screamed at him and threatened to kill him, he added. Ranatunga pointed out that it was evident that the intention of the mob was to kill him and his life was in danger. He said Special Task Force (STF) officials had arrived and succeeded in removing him safely. Ranatunga said that his lawyer would also represent the security guard who was still in remand.